Our vision is to have a community where no kittens are born wild on the street, no cat capable of living in a home is lacking one, and no feral cats are wanting for food, water, and appropriate care and concern. Yesterday was World Spay Day, a day that shines a spotlight on the power of affordable, accessible spay/neuter to save the lives of companion animals, community (feral and stray) cats, and street dogs who might otherwise be put down in shelters. In celebration, we want to thank everyone who has spayed and neutered their pets and outside cats. The progress we've made as a community is thanks to you! Hugs & Purrs to Joel Hailey and the Hailey Foundation for showing the film "Ten Lives, A Feral Cat Odyssey" last night at their annual Spay Day Banquet! SAFCC was well-represented and the packed room was informed about what we do! It's March but we're already in Fiesta mode! Here's a sneak peek of our Viva Fiesta Medal! Medals will be out at the end of March and will be priced at approximately $10 - $12 each. Proceeds will benefit the San Antonio Feral Cat Coalition. Be sure to add this feline bling to your fiesta wear and to represent San Antonio Feral Cat Coalition to everyone celebrating fiesta. Follow our website or Facebook page for updates on when medals go on sale. Expenses include: foster care, veterinary care, colony food, purchase of traps and other equipment, mileage, trapper fees paid to clinics, etc. SpaySA asked SAFCC to select a location for a 30-cat TNR project for SNAP's mobile clinic. Our "fabulous 4" SAFCC trappers pictured here trapped all day on Feb 13 and delivered cats on a rainy Valentine's Day morning to the SNAP mobile clinic on site for spay/neuter. All cats did well and have been returned to their lots where trapped. Many thanks to Cathy McCoy and SpaySA for selecting SAFCC for this project; to SNAP's wonderful vet crew who worked tirelessly all day; and to our wonderful trappers: Susan Schmahlenberger, Virginia Brown, Chris Bigelow, Donna Dickerson and Kay Keane (not pictured)! Click HERE for all pics from this project. Thanks, everyone, for a job well done! There are 30 cats that celebrated Valentine's Day by starting a happier, healthier life - thanks to you, SNAP and SpaySA! Celebrating a Birthday? Having a lunch meeting? Or just need to re-fuel while shopping.... Present this FLYER when you dine in or take-out and 20% of your bill will be donated to SAFCC. With two convenient locations, which one is closer to you? California Pizza Kitchen (Huebner Oaks) or California Pizza Kitchen (Quarry). 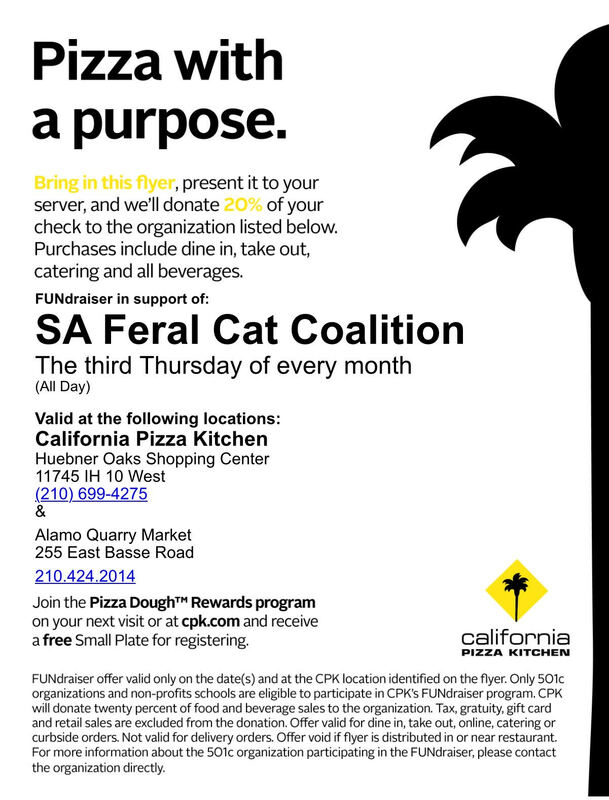 This fundraiser occurs every Third Thursday at both California Pizza Kitchen locations. Enjoy a healthy meal while helping our community cats stay healthy! Have fun shopping and saving while supporting community cats! Whether you are looking to fill your closet and home with beautiful, like-new items for a discounted price, and you would like to find a new home for similar items that you no longer use, Uniquely Yours Resale and Consignment Shop in San Antonio is a top choice. Bring in items and SAFCC's Community Cat Adoption Program gets 50% of all sales when you tell them it's for us! We are Code 500. Animal Care Services will host a series of public meetings across the community to discuss potential revisions to local animal laws as well as the shelter's Strategic Plan. San Antonio residents are invited to offer input at any of the planned meetings which will take place over the course of the next several months. Please note when your District meeting is and make plans to attend. This is a good opportunity to let our public officials know that people who care about outside cats are interested and involved. Join us at any of the upcoming events! ACS will provide the first 150 pets free microchips and dog leashes. Being held by the SA Metro Healthy Start Program to raise awareness about the issue of roaming animals on the West side. Talk About It SA's 5th annual pet fiesta offering free spay/neuter, free microchips, low cost shots and adoptions. We need a Face-painter for this event! Respond to this email if you're interested. SAFCC is again adding some "MEOW" to this popular Bark in the Park event! Join us March 4 and 5 to adopt a cat from any of our Petco locations. You can help us earn a lifesaving grant for each adoption performed during the Petco Foundation's Love Changes Everything adoption event. Organizations performing 5 or more adoptions in the stores on these two days will receive adoption grants of $35 per cat! paid from our Cat Crisis Fund to help sick or injured outdoor cats. Help us continue to do this important work for our city, please DONATE!